Date: Sunday, June 13th. Food Heaven. Today is all about food, so please let us know in advance if you are a vegetarian or have special dietary requirements. We are beginning with a visit to Shinpuku-ji, the oldest temple in Aichi (it was established in the 6th century under the direction of Prince Shotoku), which is in the forests in northern Okazaki. Apart from a long history and beautiful location, this temple is famous for the quality of the temple cuisine. 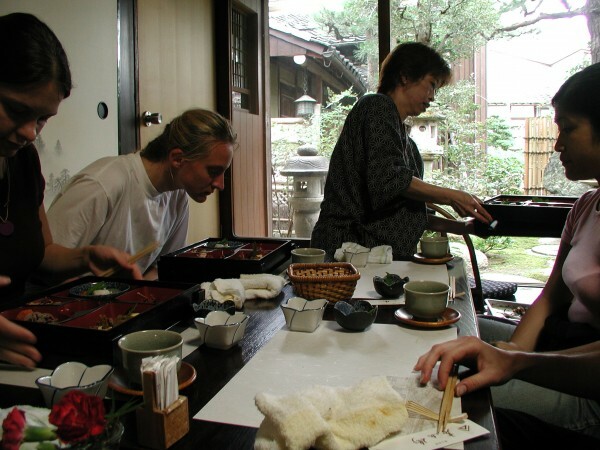 We will be eating Shojin Ryouri, and at Shinpuku-ji the type of food is called Takezen Ryouri (竹膳料理) as the temple is especially known for the quality of the bamboo shoots growing in the extensive grounds of the temple. We will be enjoying a sumptuous lunch before taking a walk (fortunately a downhill walk!) through the forests. (Think of this trip as Koya-san without the long drive). 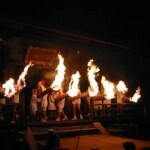 Oni Matsuri held in February each year. Takisan-ji is worth a visit any time of the year. Next we are going to nearby Takisan-ji and Takisan Toshogu. The foundation of this temple in northern Okazaki dates back to the latter half of the 7th century. An ascetic priest who had been living as a hermit in the nearby mountains is said to have constructed the temple on the orders of the Emperor Tenmu (emperor from AD 673 to 686). These days, the main hall of the temple is famous for its perfection of the Kamakura Period (1185 – 1333) style of architecture – dating from its reconstruction in that style in the year 1222. The colorfully decorated Toshogu shrine next to the main hall was one of the first built in Japan, enshrining Tokugawa Ieyasu as a deity. Along with Nikko (Ibaraki prefecture), and Kunozan (Shizuoka), it is one of the finest Toshogu. From Takisanji we head east into Nukata, and a valley with very pure water tumbling down from the forests covering nearby Mount Hongu. The forest and little bit of altitude provides a nice respite from the summer heat and humidity. 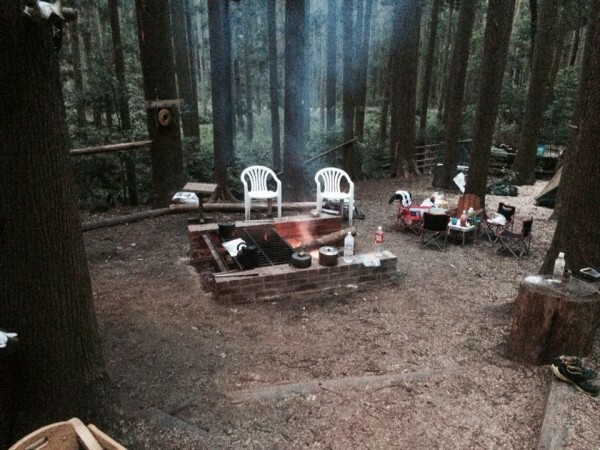 Deep in the forest, surrounded by flowing streams, we will be visiting ALC friends who have built a fantastic campsite complete with tree houses, and even a wood fired pizza oven. We will catch and grill Ayu, a small trout popular as a sweet fish, or rainbow trout, and have a long barbecue while we wait for the sunset. We will have some incredible mushrooms, and even some very high grade Mikawa Beef （三河牛） available for you to sample. 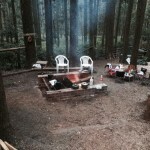 If you wish to rest but still enjoy the sounds of the forest and flowing streams, there is a small outdoor bar. We will visit this wonderful place again in August. We will stay until after dark, because the valley is noted for Genji Hotaru, a Japanese species of firefly. 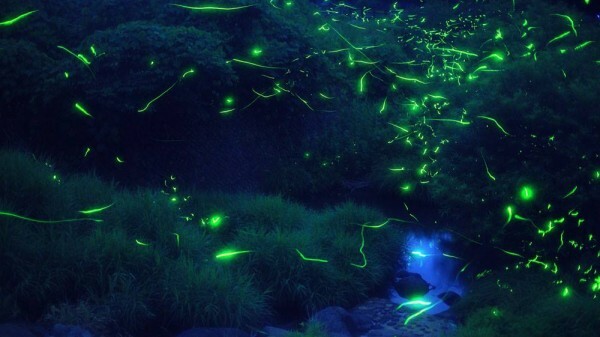 Common in the temperate areas of Japan (and Eurasia/North America), the glow of fireflies is a common sight in rural areas of Japan in June. These days they are more plentiful as there has been a sharp reduction in recent decades of the use of firefly unfriendly chemicals in Japanese agriculture. 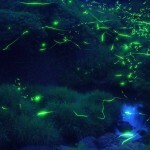 Due to altitude, the fireflies in this valley can sometimes appear in early/mid or late June. 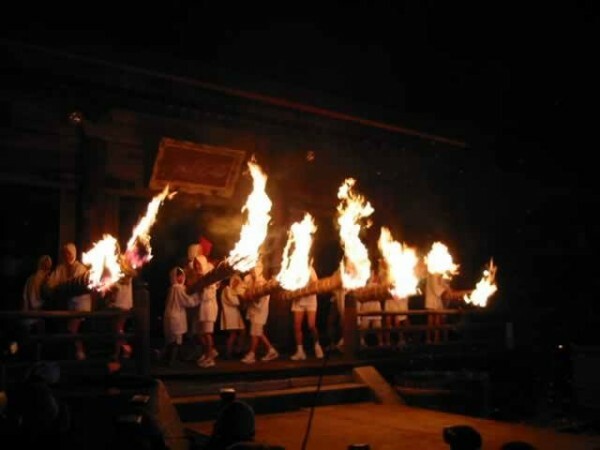 If we can’t see them at the BBQ site we will move to the village of Natsuyama (the neighboring valley) and watch them there. It isn’t unusual to see monkeys, deer and other wildlife. You can relax at the bar, climb up into a tree house, have a swim in the plunge pool below the nearby waterfall, or go for a short hike along one of the ancient mountain roads (basically these are walking tracks) that connect each of these secluded valleys. During the Sengoku Jidai, armies of samurai and ashigaru patrolled the steep mountain passes and frontiers. In happier times, these roads were used for trade and exchange (miso, metal tools, horses, salt, news, brides etc). The mountains are largely depopulated now, but everywhere you go you will constantly encounter small shrines, jizo statues and other reminders of an incredibly rich history.